SearchPropertyIndia.com is a vertical search engine targeted to the people looking for properties such as Flat / Apartment, Bungalows, Villas or Land, plots. Visitors can also search for properties available for rent only. Searching property online can be a tiresome process, and at times you will not be able to find the right kind of property you might be looking for. To make this process easier we have come up with this vertical search engine. SearchPropertyIndia.com crawls real estate websites, and indexes them. And then people can search them based on city, type, etc. 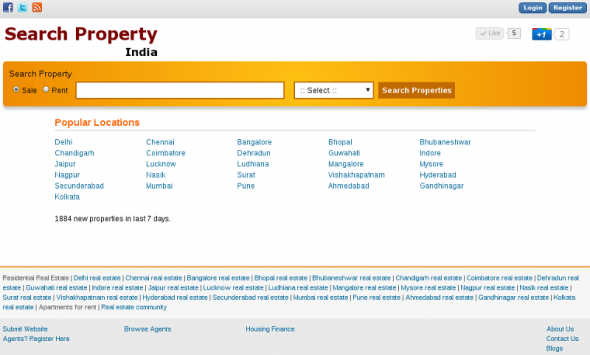 Also, SearchPropertyIndia.com has ability to search properties based on locality within a city. All major locality of cities are available to further narrow down your search. Agents: This is also a platform for real estate agents to connect with potential customers. Agents can register on the website, and people searching for properties can contact agents from those cities.